SWTOR: Space Combat or how do I fly this thing? Yup, Mako and I are doing a pre-flight check before trying to complete a space mission again. I need all the help I can get so I want to make sure the ship is in tip-top condition. I’m going to try to post this under the radar. Maybe I won’t tweet about it. 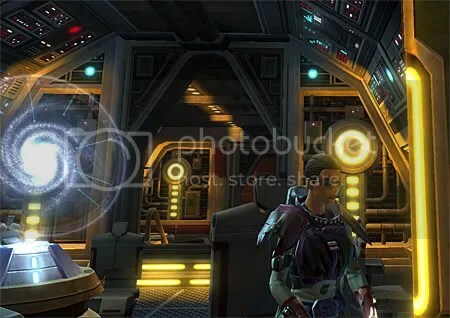 I read a post by Gladly at The Ready Check about how SWTOR has affected her WoW raiding. I felt really bad about it. 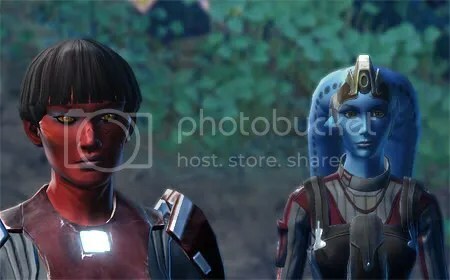 She’s not the only one feeling the effects of SWTOR, it seems many guilds have been touched by the SWTOR flu. Someone was recruiting in Tatooine the other day and they gave me the address of their guild’s application form. I was thinking about it, but when I read the apps of people applying it put me off. 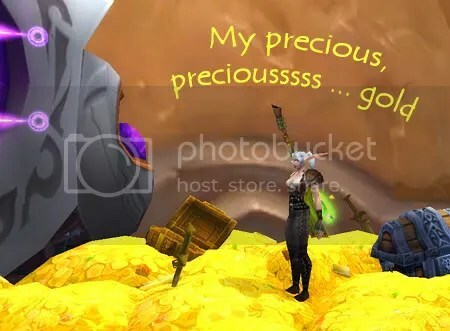 Almost everyone seemed to think saying something negative about WoW was required. What’s up with that? I’m a WoW player too; I don’t want to be in a guild of WoW haters. In my case absolutely no WoW raids have been affected by my vacation in SWTOR. No raiders died in the making of this post. I’m not even really gone from WoW, never happen unless Blizzard locks me out. I am not a butterfly who flaps her wings and causes a butterfly effect across the face of Azeroth. So if you are causing a WoW butterfly effect, shoo … go on … get back to your raid. I really just wanted to let you know I put up a link on the SWTOR resources page about space combat. I was having a lot of trouble with space missions and this helped a lot. First, I thought I was in control of the ship. I kept trying to wrestle control of my path from the ship. You have no control, stop trying to turn around. You can’t. 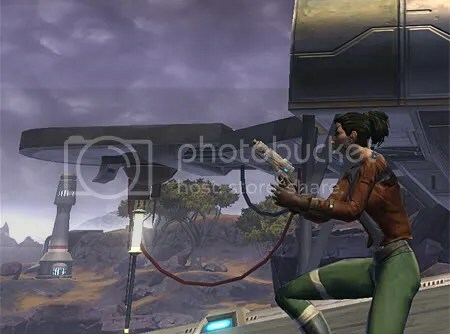 And thank you so much Star Wars: The Old Republic, all that time I thought I was firing my missiles I was really just shooting measly bullets at them. Just one more thing, how do you say SWTOR when speaking? Someone pointed out that if you sound it out you get sweator, yeah, I’m not sure whether I like that. Maybe I’ll just drop the SW and refer to it in conversation as TOR. I’ll have to alert my son-in-law as he’s the only one I’d be likely to be conversating with about TOR. Anyway, if you have something better than TOR, let me know. We need to all vote on this or something. Okay just humor me for a minute. There’s not much to watch in the video and it’s short, it’s all about the sound. I have at least one of each SWTOR class, although I think I might have three Smugglers, not sure how that happened. But my Bounty Hunter undoubtedly is my favorite and I’m pretty sure the sound of her missiles is why. Poor girl is trying to save money. Her gear is whatever she finds for the most part, but she doesn’t care how long it takes to kill something, she is just getting down with that Bounty Hunter music. There is such a visceral feeling of power with that sound, I’m a literal killing machine, aaaaaaaaarrrrrrrrrrrggggggggggggghhhhhhhh … oh God, somebody stop me before I kill again. What? I’m a Bounty Hunter, I don’t have to stop? Yesssss! Yeah, I know I shouldn’t be using skills based on the sound they make but I just can’t help it! The sound of a Bounty Hunter echoes for a fair distance. When I hear it echo through the hills, I think … Oh, my homies are near … I’m rolling with my homies … my brethren in arms, killing things with giant missiles, flamethrowers, two blasters … sigh, life is good. I think the last sound that affected me to this extend was the THX Sound Effect. I love that thing, but this is better. So last time I talked about SWTOR I think I promised I’d go out and find some information that was at least as exciting as speeders for you swtorers … swtorians? Do we have a name yet? This is proving harder than I thought. I have some info but it’s no where near as exciting as speeders are, but I’m trying okay. I thought I’d better hurry and seek medical attention and found every Medical Droid I checked had the cure for sale, the Czerka VX-736 Injector. Buy that baby and you’re good to go, right as rain again. Yeah I know, not as good as speeder info but in case you haven’t seen these yet, there are Security Chests that can be found almost anywhere. I’ve started checking any empty building I come across because I’ve made a few thousand credits from Security Chests in vacant buildings. I’m not going to farm for them but I do keep an eye out, free credits are a good thing. I’m afraid that’s all I’ve got right now. Since the thrill is not gone from WoW for me, be patient, I’m working double shifts here. I need to get out there with my missiles, and AAARGH, burn baby burn … oh, sorry. I meant I need to get back to my class quest and hopefully find more new and interesting news. Yeah, that’s what I meant to say. 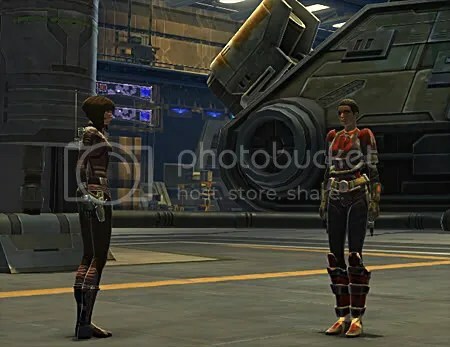 You might want to check out Psynister’s Notebook, long a source for solid WoW information, he’s now sharing SWTOR tips with leveling guides soon to follow! I think Joan Jett is a perfect accompaniment to the sound of missiles and blasters, don’t you? Horrifying isn’t he, yike! 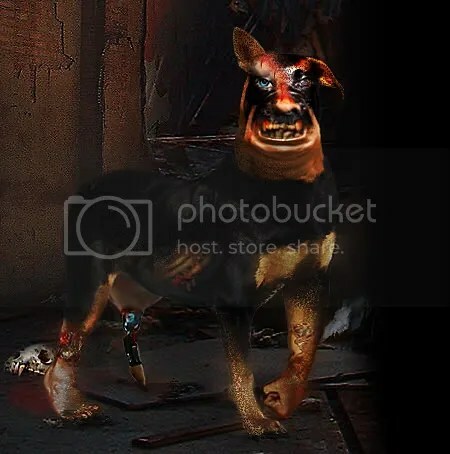 Oh hey, it could happen, I mean there are cyborgs in SWTOR why not cyborg companion pets? Okay so there aren’t really cyborg dog pets yet in SWTOR, I may have fudged that a little. This picture was actually therapy for me. When one of our dogs was a mere pup he was as destructive as a platoon of bounty hunters, chewing through our house at an alarming rate. I think after he chewed the leg off the dining room table I went upstairs and did this to vent. The part of the cyborg that’s actually my dog is the lovely brown eye. I really hadn’t planned on saying anything today but I woke up this morning and checked my blog stats and I was ecstatic! 510 page views yesterday! Unbelievable! Yay! Thank you kind readers! Hey, this is exciting to me. I’m not a cool kid. I’m never going to be featured on WoW Insider, so to me this is one big whoop! I was somewhat bemused by the traffic, I mean even I wondered what the hell they were doing but I finally got to the bottom of it. 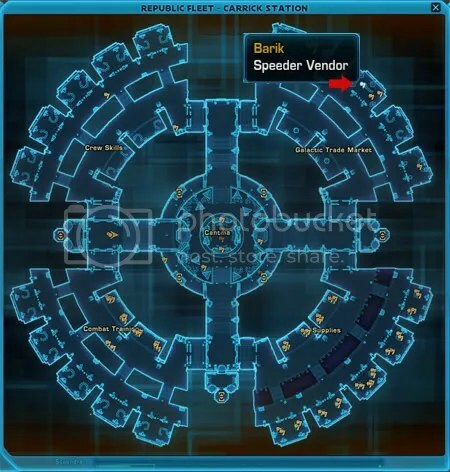 SWTOR speeder vendor. The magic keyword. So I can’t give you fine writing but I have decided to become the SWTOR Faxzinator! Your one-stop shop for SWTOR facts. So I admit the whole cyborg pet thingy was a scam the following facts are not. 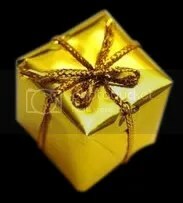 I went and got them for you just to say thank you for yesterday. Sometimes I don’t know how I manage to level in game. I tend to run around looking at all the sights and I’m totally oblivious to the really important things like my skills. 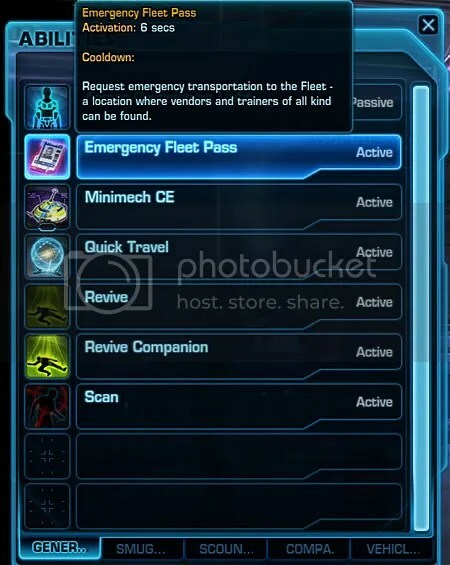 Emergency Fleet Pass! How cool is that! I have another Smuggler on another server who is about level 15 and I didn’t know she had this. I accidentally found it when clicking the general tab instead of smuggler. A free get out of jail card. I used it just so I could let you know it is indeed on an 18 hour cooldown but still, great to have. Since I was there thanks to my Emergency Fleet Pass, I ran around and found the location of the Republic speeder vendor too, out of gratitude to those 510 people. Pretty much same location as on the Imperial Fleet. So there, some SWTOR facts for my precious, precious, 510. Okay, one scam companion pet but two true things so it kinda balances out. I love you guys, you are my BFFs! Come back again, I’ll serve virtual cookies!